Securely book your special break here! Autumn weeks are going quickly and you will always get the best prices by booking directly on this website. The owner has many years of successful letting and will happily advise you or answer queries. Enjoy the new eco-friendly glazed conservatory with one of the finest views in the Highlands in complete comfort, whatever the weather. Click on heading above to see. Our 15th visit since 1995! Glendarroch as welcoming as ever. We’ll be back! We agreed unanimously that this was by far the best equipped holiday cottage we had ever stayed in & between us over the years that has been quite a few. The standard of cleanliness was exemplary! In more than 40 years of self catering in Sutherland and Wester Ross, Glendarroch is the most comfortable, and best equipped holiday home with the most superb view. Welcome to Glendarroch House, luxury Quality Assured self catering with a difference. Glendarroch House is special. Nestling in its own wooded glen and grounds of 15 acres, it offers exceptional peace, privacy, comfort and convenience when exploring this fascinating part of the Highlands. It has been owned by the same family for the last 170 years. 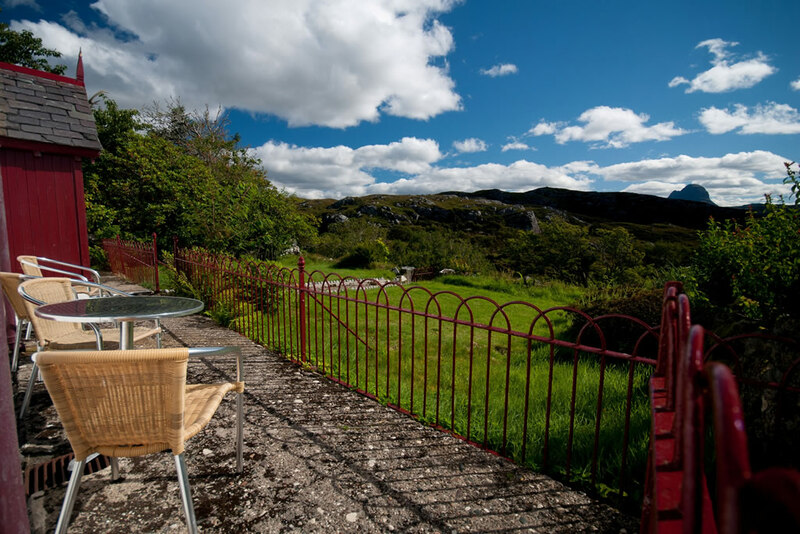 Facing an outstanding panorama of the famous mountains of Assynt, it is minutes from the popular village of Lochinver and only a short journey to the pristine sandy beaches and rugged coastline further north. A paradise for walkers, anglers and nature lovers, you can walk away from the front door in any direction and enjoy a unique sense of freedom and relaxation. Popular with discerning professionals seeking that special place away, it provides a home from home for couples, families and friends, sleeping 6 in comfort. Children relish the space, inside and out. You will share your privacy with nature all around; the rare otter, badger and pine marten have been seen in the walled garden; red and roe deer are frequent visitors; and the rare eagle and red throated diver are amongst the many birds that may be spotted in passing. Many visitors return to Glendarroch year after year, read some of their testimonials. You too can be assured of a warm welcome and a memorable holiday.